The Church of the Ascension, affectionately known in the Hertfordshire village of Bedmond, as the Tin Church, is one of only two such churches in the country. The Church was built in 1880, and is an early example of the pre-fabricated buildings that were sent to the Colonies for 'instant' churches. 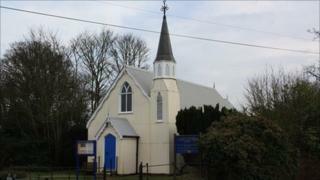 The late 1800s saw an enormous growth in church and chapel building and the so-called "tin tabernacles" grew in number across the British Empire. This church is thought to have been surplus to requirements and was bought for £80 by Mrs Solly, wife of the then Squire of Bedmond, and presented to the village. The tabernacles were an early form of pre-fabrication and were often the first stage in the growth of a church, more permanent structures taking their place. Over time, many have succumbed to the British weather which has caused them to rust away. The corrugated exterior of the Tin Church has a spire and a stained glass east window, however, the outside belies the warmth and beauty of the timber-lined interior. It has survived with a a good deal of loving care and is now a Grade II listed building . Worship is held on first and third Sundays and is packed each year for the annual carol service.